The National Association of USS LCS(L) 1-130 held its 21st annual reunion on August 8-11, 2007, in Warwick, Rhode Island. This organization with a somewhat cumbersome name represents veterans who served on Landing Craft, Support (Large) (LCS(L)) from 1944 to 1946. These 130 ships, each with a crew of six officers and 65 enlisted men and with a number from 1 to 130 rather than a name, distinguished themselves in battle action in Okinawa, Iwo Jima, the Philippines, and Borneo. Over 60 LCS(L) veterans, including two men who have attended all 21 annual reunions, went to the 2007 reunion to reminisce about their WWII experiences and to participate in various scheduled activities such as a visit to Battleship Cove naval ship exhibits in Fall River, Massachusetts. An LCS(L) ship, 158 feet in length, had two twin 40mm guns, four 20mm guns, four .50 caliber machine guns, another gun on the bow, and ten rocket launchers. LCS(L)s, nicknamed "Mighty Midgets," experienced numerous suicide attacks from kamikaze planes and explosive motorboats during WWII. In the early morning of February 16, 1945, explosive motorboats attacked and sank three LCS(L)s at Mariveles Harbor in the Philippines. Kamikaze planes sank two other LCS(L)s and hit several other ships during the Battle of Okinawa. As kamikazes frequently crashed into American destroyers at picket stations surrounding Okinawa, LCS(L)s picked up survivors, fought fires, and pumped flooded areas of damaged ships. Gunners on LCS(L) ships also shot down many Japanese planes that attacked radar picket stations. My wife Noriko and I went to the LCS(L) 1-130 Saturday night banquet attended by about 180 people. We had the honor to sit at one of two tables for LCS(L) 61 veterans and family members as a guest of Rob Rielly, whose father served as ship's Quartermaster. Rob serves as Historian and Archivist for the association, and he has written a history of the 130 LCS(L)s entitled Mighty Midgets at War, which served as my introduction earlier this year to the critical role played by these ships at picket stations around Okinawa. LCS(L)s, along with destroyers, defended the main American fleet from Japanese kamikaze attacks from April to July 1945. LCS(L) 61 and LCS(L) 86 have had a friendly rivalry that dates back to 1945 in the Philippines, when 61's crew defeated 86's crew in the playoffs of a softball tournament despite 86's win-loss record of 7-1. The individual LCS(L) ships have a friendly competition each reunion for recognition as the ship with the greatest number of men in attendance. LCS(L) 61 won this year's competition with eight veterans at the reunion, although LCS(L) 86 came in a close second with six in attendance. At the Saturday night banquet, Bill Mason, who served aboard LCS(L) 86, gave an update on the transfer of LCS(L) 102 from the Royal Thai Navy to the National Association of USS LCS(L) 1-130 on May 22, 2007. The Thai Navy had been using this LCS(L) ship under the name of Nakha since 1966, when the U.S. Navy loaned the ship to Thailand. The LCS(L) 102 is the last of the 130 Mighty Midgets that served in WWII, so the association has been actively working for several years to negotiate with the Thai and US governments to retrieve the ship. Mare Island Historic Park, just north of San Francisco, plans to have the ship opened as a museum in time for the 2008 reunion of the National Association of USS LCS(L) 1-130 so that veterans can step aboard an LCS(L) for the first time in more than 60 years. The ship will serve as a memorial to the 164 men who died in WWII while serving aboard LCS(L) ships. Before the Saturday night banquet, I spent some time in the reunion's hospitality room, which had several exhibits related to LCS(L)s such as photos, an LCS(L) model, and books. 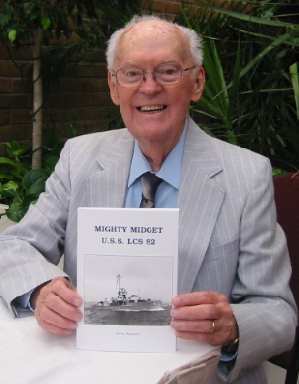 There I met John Rooney, who published in 1990 a book entitled Mighty Midget U.S.S. LCS 82, which includes his experiences as radioman aboard the ship and the recollections of over 20 of his shipmates. He explained how LCS(L) 82 and LCS(L) 84 saved the destroyer Evans (DD-552) after four kamikaze planes hit the ship on May 11, 1945. LCS(L) 82 brought aboard wounded and dead, pumped the flooded areas on Evans, and helped shoot down a kamikaze Val (Navy Type 99 Carrier Dive Bomber) diving at the stricken destroyer. On May 27, 1945, the LCS(L) 82 assisted again when two kamikaze planes hit another destroyer, Braine (DD-630). John's ship fought fires aboard Braine and pulled survivors out of shark-infested waters. The Saturday night banquet concluded with the raffle's grand prize of a beautiful red, white, and blue quilt made by a talented association member. 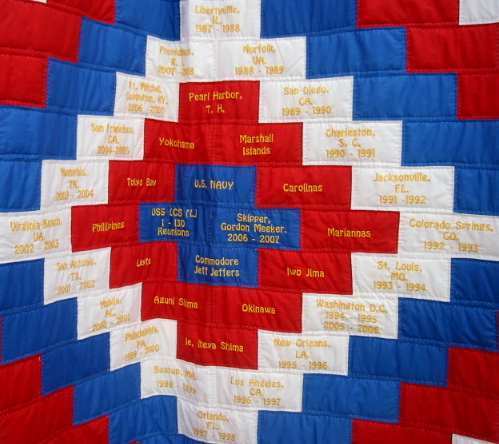 The quilt's center displays LCS(L) destinations such as Pearl Harbor, Okinawa, Marshall Islands, Iwo Jima, and the Philippines. 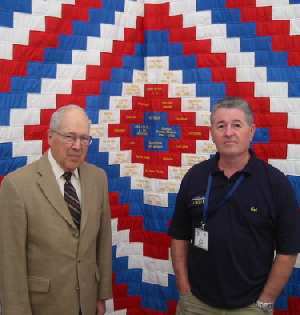 The quilt also shows prior locations of annual reunions of the National Association of USS LCS(L) 1-130, starting with the first one in 1986 in Libertyville, Illinois. Everyone left the banquet looking forward to the 2008 reunion in San Francisco and to the opportunity to step aboard LCS(L) 102 at Mare Island Historic Park.